Join CAGJ’s Teach Out! Sat Aug 22: Visit Jubilee Farm & Local Roots Farm! Teach Out! Engaging the Local Food Cycle! Our visit to Carnation, WA will begin at Local Roots for a farm tour, and then continue down the road for a work party at Jubilee Farm! Both farm stops will offer opportunities to talk with the farmer and ask questions! Founded in 2007, Local Roots is a diversified vegetable farm. They grow a wide variety of vegetables, herbs, fruit, and now chickens on about 5 acres of land. Local Roots delivers fresh, delicious, and healthy food at local farmers markets, through their Community Supported Agriculture program, and to local restaurants. Find out more at www.localrootsfarm.com. 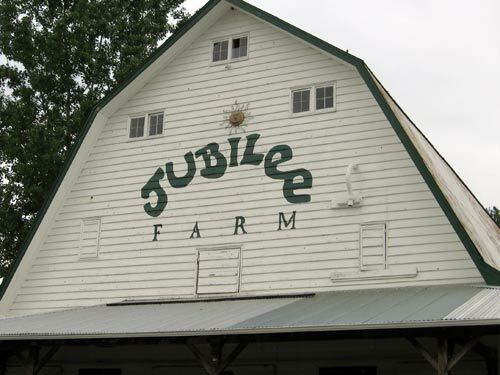 Jubilee Farm is celebrating its 20th year in Snoqualmie Valley. The desire to become sustainable has led owners Erick and Wendy Haakenson from the state “certified organic” program to the Biodynamic farming tradition. The transition to Biodynamic is in its fourth year, and is still a work in progress. Jubilee Farm enjoys a loyal following of CSA members who support the farm in its quest to achieve sustainable farming practices. Find out more at www.jubileefarm.org. Stay tuned for visits this summer to a Vashon Island overnight and Clean Greens work visit!